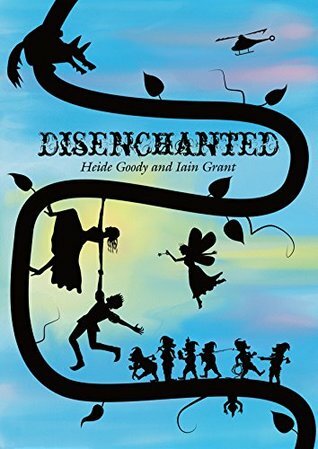 Firstly I wish to thank Heide Goody and Iain Grant for inviting me onto their BLOG TOUR for DISENCHANTED because I am over the moon! What a blast! Once upon a time there were two authors who got to together and wrote a fairy tale that combined all my favourites from when I was a little girl. Having already read other books by this super duo that can seamlessly write like one author with two heads, or is it two authors with one head? I just knew to have the tissues ready. No their books are not sad, far from it. I knew that I would need to mop up tears from laughing and after reading this Fairy Tale strictly for adults, I suggest that future readers have a couple of boxes on hand. OMG each story is so very easily recognised and yet so far from the original like a polar opposite and it all came together in a brilliant remake that had everything that someone with fond memories of childhood had, to their changing reading habits of books with lets say more about them, adult humour, some swearing and an all action adventure. This book is in a class of its very own! When Ella Hannaford was a little girl her Granny Rose warned her about not talking to fairies or accepting gifts from them but fairies are magic and like real people they can sometimes pretend to be someone they aren’t and trick little girls. Luckily Granny Rose is quite an all round Granny and knows how to deal with such things, after all she was a tough old bird with arms like Popeye the sailor man. The fairies was certainly not done with Ella but it would be as a grown woman she would encounter a fairy again. This is one psycho fairy that is determined about how Ella’s fairy story life should play out. Just loved every character in this book, from the seven dwarfs that were very aptly named to Granny Rose and the Big Bad Wolf. Of course being a true Disney lover my favourite has to be the very reluctant notwannabe Princess, Ella. She is a lady that I am sure takes after her gran, but without the Popeye arms. I was truly giddy reading this book, well I say reading I actually listen to my books which meant I didn’t even have to stop when my eyes got blurry with crying! In my current search for Lang’s Black Fairy Book, we took a taxi-cab from Sheffield to Uttoxeter. En route, I avoided the eye of the fox-like and monobrowed driver. Instead, I read the first few chapter of your book out to Pak Choi, my retainer and travelling companion, skipping over the more ‘fruity’ language you have used (which meant missing out most of the second chapter, I’m afraid). Pak Choi had a few choice words about your depiction of his fairy kindred and I have made some notes in the margin for your benefit. I had telephoned ahead and arranged to visit the house of a retired librarian, Bunty Jangles. I knew Bunty from her time working in Sheffield’s archive, but I remembered that she’d moved back to her home town of Uttoxeter some years before. Her house was a short walk from the station, past the racecourse. There’s a fine tradition of racing in these parts, and I recalled the tale of The Dancing Goat. It’s a story that goes back to the time when trading animals was a key part of the local economy. Uttoxeter was granted a market charter in 1251, and it was necessary to be on the lookout for sharp practice at all times in those days. A farmer wished to buy a pig, and had heard many stories about unwary buyers being passed off with a bag containing a cat or similar. You will know of course that this is the origin of the saying ‘to buy a pig in a poke’. This farmer clearly wasn’t familiar with what a pig actually looked like because instead of taking a careful look at the animal in question, he devised a test. It was said that a pig was the slowest of the beasts, and so his test was to put the animal in question into a sprint race with another animal whose provenance was known. He came upon a trader who was willing to submit his animal to this test and the farmer arranged for his neighbour’s pig to be entered into a race with it. Word spread, and bets were placed on the two animals. The crowd gathered as the race started, and the two animals were released simultaneously. The neighbour’s pig ran directly to the finish line, and the trader’s animal danced on the spot before trotting gently into second place. The farmer happily bought the beast, upon which the rest of the crowd informed him that it was in fact a goat. The tale ended happily however, because the farmer and his dancing goat were in great demand for festivities. Bunty’s house is on the Stafford Road and she sat us down with a slice of her delicious apple pie. Bunty is a wiry old bird with an energy about her that many young folk would envy. She listened to all that I told her about the clue I had been presented with in Leeds, the tantalising prospect of finding Lang’s missing work and the mention of a ‘domunculus’. I hazarded that it was a word she had mentioned to me some years before although it sound thoroughly made up. She fetched a book, Treasures of Yesteryear, from her shelf and opened it to a passage on the Uttoxeter Casket, an Anglo-Saxon reliquary. I do not know if you are familiar with reliquaries. Pak Choi confessed a certain ignorance regarding the word although I would image that authors such as yourselves would have a much larger and refined vocabulary (although on our journey down Pak Choi had noted your over-reliance on certain vulgar terms in your narrative and wondered if you simply resorted to ‘effing and jeffing’ when you could not find the right words to express yourselves). A reliquary is, as I’m sure you know, a box made to contain religious relics. The illustration in the book was of a very ornate box, beautifully carved from wood. The text below said that medieval witnesses called the box a ‘domunculus’ because of its house-like shape with a gabled roof of sorts for a lid. Just then Bunty’s dog jogged into the room. The jolly chap was a terrier, which I remembered well from years before. Pak Choi smiled broadly, he is very fond of dogs (although not in the same manner as his more carnivorous kin). Bunty asked me if I had ever heard of the Talbot Hounds. I shook my head. It was a breed that is extinct now, she told me and it was a family emblem for the Earls of Shrewsbury. She went on to explain that legend tells of a cousin of the fifteenth Earl was waited on by a set of fully liveried dogs who staffed his kitchen and served his food. He thought so highly of his Talbot Hounds that he regularly played poker with them. By all accounts they were better at it than he was for he lost his house to them. He was forced to shoot them all to avoid a difficult scene. He spent the rest of his life living with remorse for ending the line of a noble breed. Even now, Alton Towers, which was built by the Earls of Shrewsbury has the dogs as heraldic devices in the grounds. They had an animatronic version called Henry back in the eighties, who would sing country and western songs. I thought that thoroughly ghastly and shuddered. I asked Bunty where I might find this Uttoxeter Casket and was told in reply that it was in Cleveland. “Over Stockton way?” I said, my heart sinking. We departed soon after Bunty’s startling news. It made it hard to know what I should do next. I have after all committed to being present at the launch of your book, Disenchanted, and a trip to the United States could put that (and my bank balance) in jeopardy. As we passed by the garden gate on the way back to the station, the elderly gardener called me over and pressed a tiny bunch of pansies into my hand. Whilst I was grateful for the gesture, he held onto my hand for rather longer than was necessary, and Pak Choi had to tug me away. Pansies are a favourite of mine, and Pak Choi and I pressed them between the pages of a book later that evening, so that they don’t spoil while we’re away on the next leg of our journey. Dr Epiphany Alexander’s latest book, “Six Out of Seven Dwarfs aren’t Happy: The Mistreatment of Little People in Fairy Tales” is currently available from Sheffield Academic Press.